Home » Cross from Mount Athos. Monastery of Caracalla. 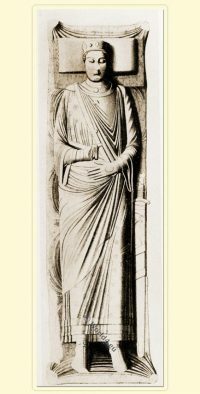 Since the time of the later Christian Emperors of Constantinople, it has been celebrated chiefly for the number of its monasteries, on which account it received the name of the Holy Mountain (or, as it was called by the Italians, Monte Santo). 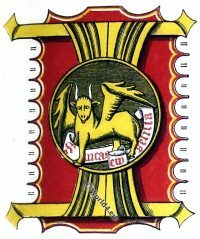 These monasteries are singularly interesting to the antiquary, because in them are preserved the manners and the arts which characterized the monasteries of the west of Europe, previously to the general introduction of the Benedictine Rule. 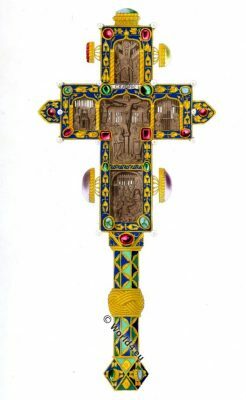 One of these, the monastery of Caracalla, possessed for centuries the beautiful cross represented in our plate, which was used by the bishops of the Greek Church at the feast of the Epiphany, for the purpose of blessing the water. It is connected with the name of one of the bravest princes of the Lower Greek Empire, having been given to the monastery of Caracalla by the Emperor John Zimisces. 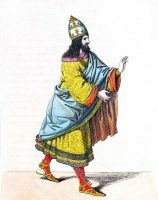 John Zimisces was an Armenian soldier in the Greek army, and was raised into power and influence by becoming one of the numerous lovers of the Empress Theophano. Although he ascended the imperial throne by the murder of her second husband, the usurper Nicephorus, yet as Emperor he obtained the love of the people by his rigorous execution of justice, by his respect for the church, and by his splendid victories over the Russians and Saracens. After a short reign, John Zimisces is supposed to have died by poison, in the year 969. This Cross was recently presented to the Honourable Robert Curzon, junior, in whose possession it still remains, and is an interesting specimen of Byzantine art in the tenth century. It is generally known that previous to that time the Byzantine style was employed universally in the buildings and ornamented articles of western Europe. Many of the latter were doubtlessly brought from the East. This Byzantine Cross has thus a double interest for the English Antiquary. 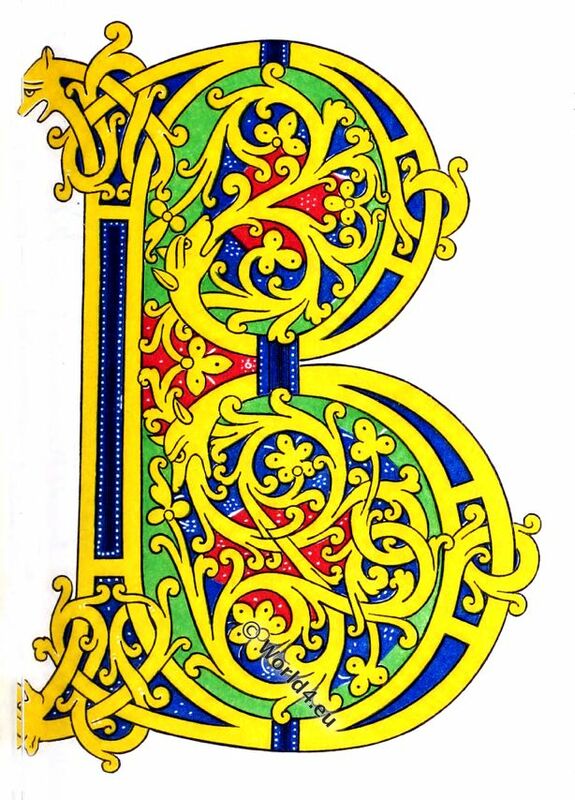 In no remains of past ages can we trace so distinctly the prevalence of the Byzantine style in the West, as in our earlier illuminated manuscripts. We have a splendid example in the Durham Book (Nero D. IV. ), of the end of the seventh century; and we find numerous others down to a comparatively late period. 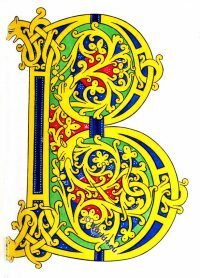 Our initial letter is taken from a fine manuscript of the tenth century, containing the Latin Gospels, with the canons and other articles which generally accompany them (MS. Harl. No. 2821.). Its illuminations are richly gilt on purple vellum, and consist chiefly of figures of the Evangelists, with one or two similar subjects, and ornamental initials. Some blank leaves (as far as regards writing) are covered with elegant mosaics, which remind us sometimes of the patterns found in Roman tessellated pavements. Manuscript of the Gospels. Book binding. The canons at the commencement of the volume are written between columns supporting semi-circular arches, which we may be justified in considering as authentic specimens of the architectural ideas of the age. The capitals of the columns are especially curious; and the columns themselves probably show us the manner in which at this early period the architectural ornaments of churches were painted and gilt. In some instances there are evident representations of marble columns. These early manuscripts of the Latin Gospels, more or less illuminated, are by no means uncommon; and in some instances, appear to have been copied from one another, or from the same original. One of these stands next to the volume just mentioned on the shelves of the Harleian Library, where it is marked as MS. Harl. No. 2820. It is nearly of the same date, and is equally curious, containing similar illuminations and mosaics, though somewhat ruder in their style of execution. On the outside of this volume is a relic of its ancient binding, an early carving in ivory in high relief, representing the crucifixion, surrounded by four compartments, containing the angel, eagle, and two animals, emblematical of the four evangelists, and thus alluding to the contents of the book. We may point out as another example, the manuscript of the Gospels preserved in the Cottonian Library, Tiberius A. 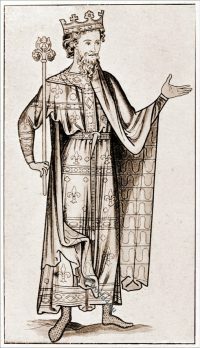 II., said to have belonged to King Athelstan. 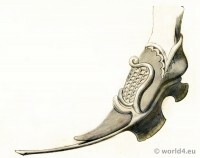 Medieval shoe of King John II. of France. 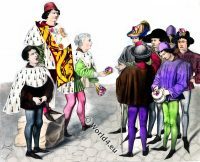 German citizens costumes in 16th Century. Renaissance Dresses. 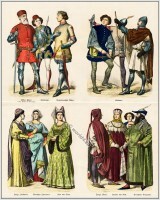 14th century clothing in Italy. Second half of the XIV century.